Slickrock is composed of the sand that was laid down millions of years ago and cemented in place over time. 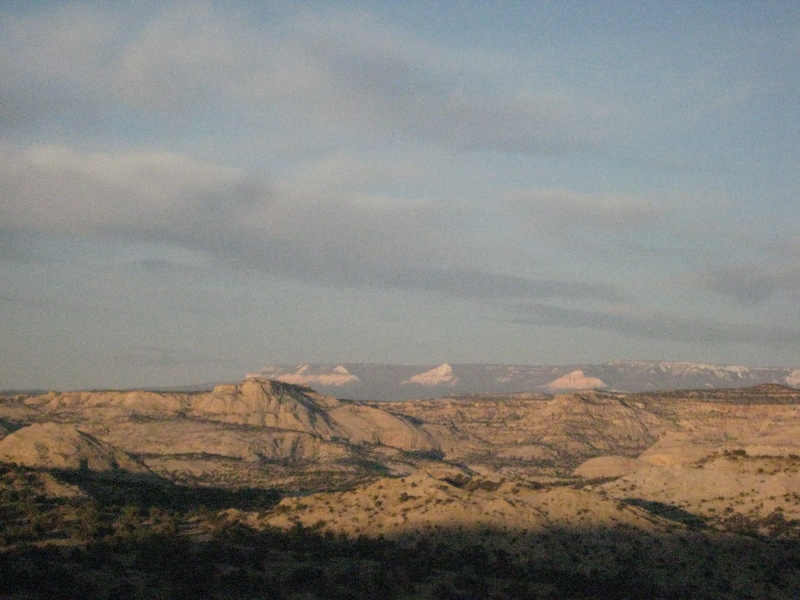 The area of the Grand Staircase/Escalante National Monument, which millions of years ago looked like the Sahara Desert, is now covered with the Navajo Sandstone. Erosion of this stone has left a landscape that offers plentiful opportunities to hike, explore and discover. 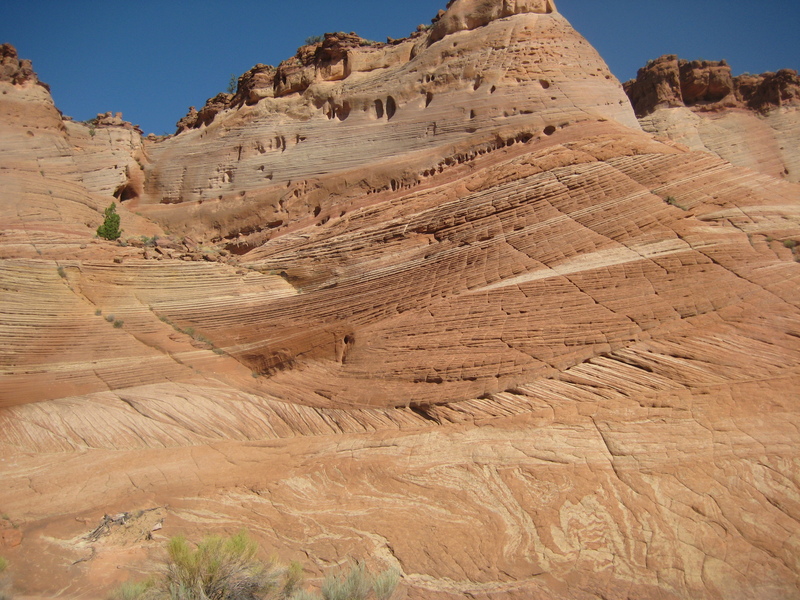 Canyons and hoodoos sculpted by erosion in the Navajo Sandstone. Erosion is nature’s artist. Erosion slowly sculpts the the slickrock to form spectacular canyons, hoodoos and bowls. Erosion architecturally designs grand arches, bridges and overhangs. Erosion plays with the palate of colors in the stone to create enormous tapestries. 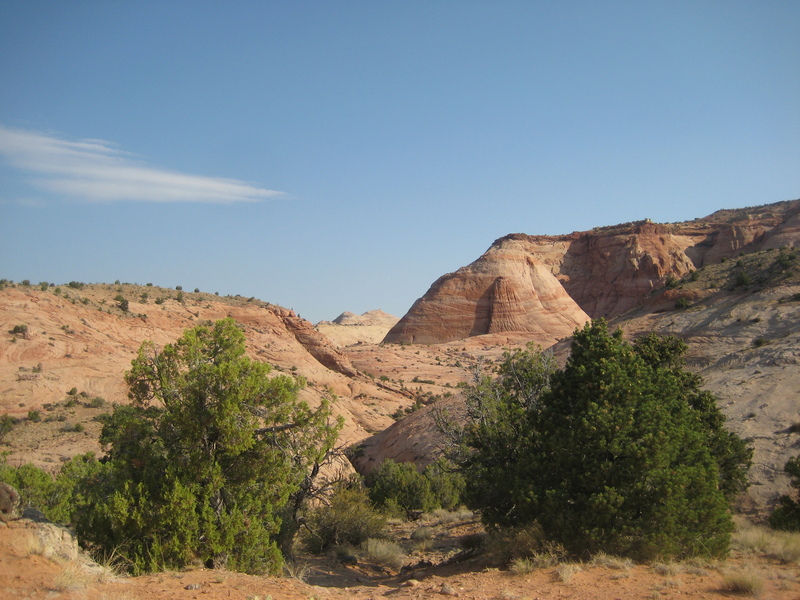 As we hike through the Navajo sandstone we will enter the gallery of erosion’s masterpieces. A slickrock wall of cross-bedded stone showing wind action on ancient sand dunes. Erosion also lays bare the history of the rock. Looking at a sandstone wall allows us to “track” the events of time. We can read the stories of millions of years in the layers on the sandstone walls. As we stand at the base of a wall we stand in wonder at the history before us. We are given the time to ponder and to gain perspective of our own lives. 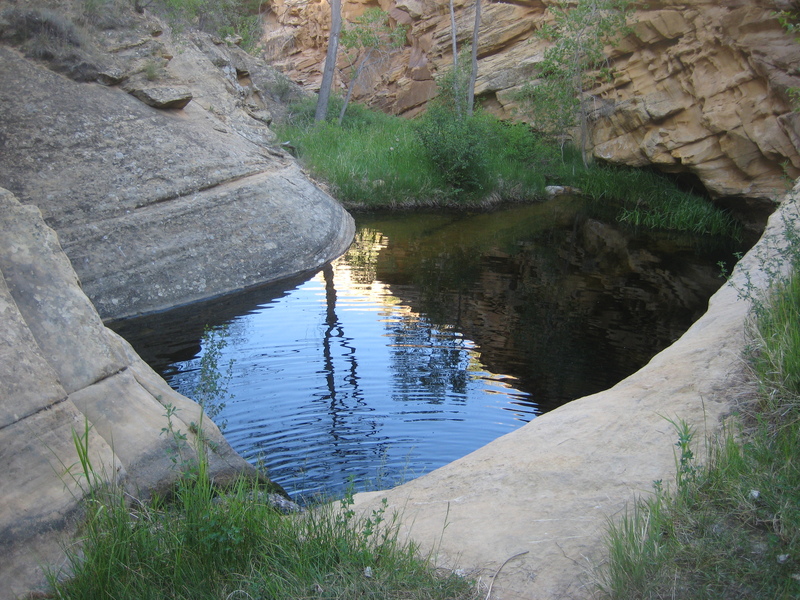 A refreshing water pocket nestled into a desert canyon. 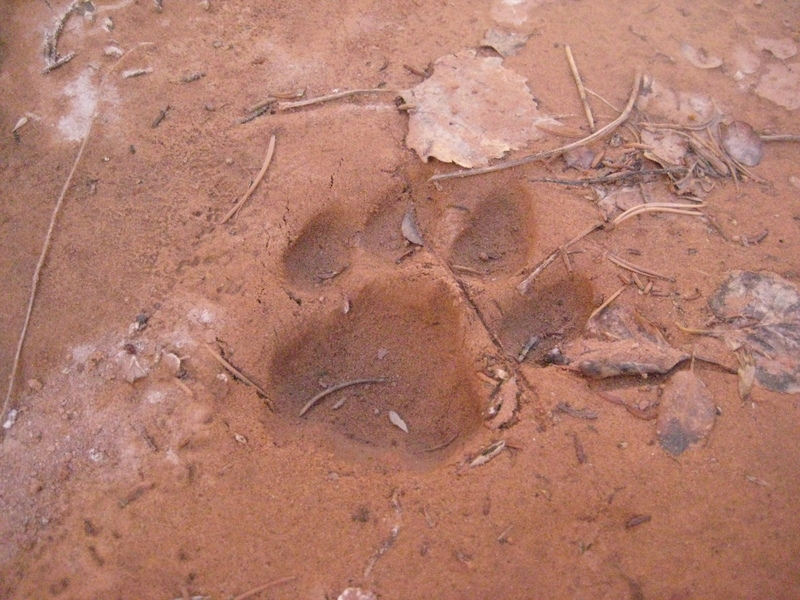 Track of a mountain lion in the mud of a pool of water. Water, water everywhere, yet none to be seen. Water, a necessity for life on earth, is scarce in the desert. It is possible to walk very close to water and not even know it is there. Water however gives clues to its existence and following these clues is rewarded with beautiful gems called tinajas or water pockets. These tinajas are a world unto themselves with their own ecosystems. As we wander across the slickrock we will discover these clues that lead us to the exploration of these mysterious tinajas. The tenacity of life surrounding these will inspire us. Our explorations will show who was at the watering hole at this day’s dawn, a mouse, a coyote or possibly a mountain lion. Petroglyphs leave a lasting story of our predecessors. Water was also critical to the humans that inhabited the desert. As we traverse the sandstone we may find tools used by these people – stone flakes, stone points, or grinding tools, known as manos and metates. We may also find cliff structures built by these people and rock art created by these people. We will take the time to contemplate the lives of the prehistoric inhabitants that put their art on the stone. We will also see first hand the tenacity of the more recent inhabitants – the old west cowboys – who carved cattle trails, and built line shacks to allow themselves a meager existance in this spectacular land. We will also discover old roads and telegraph lines that provided them contact with the outside world. The stories of the inhabitants are waiting to be found. The Slickrock Hikes are much more than just a hike over vast expanses of stone. They are journeys through time. We have several slickrock hikes available to enjoy. We will help create a hike that is appropriate to your interest and your desired level of hiking as well as for the the time of year – slickrock hikes are ideal for spring and fall though some also work well in the summer. Where ever our wanderings take us on the Slickrock Hikes, nature will not fail to astonish us. Let’s Hike, Explore, and Discover! Information on dates, rates and reservations is available on our Hike Reservations page.